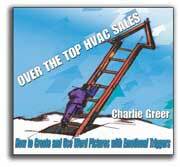 This single, 45-minute audio CD will teach you a dialogue that will inspire enthusiasm in your customers and make them feel good about buying from you, and challenge everything you ever thought you knew about HVAC sales. The info on this CD is not covered in Slacker's Guide to HVAC Sales. "Using your word pictures with emotional triggers has earned me over $200,000 in the past six months alone. One of my techs just sold over $3,000 in IAQ products using your word pictures with emotional triggers. They help my salesmen, my service technicians, and me make more sales, and make our customers feel good about buying from us."